When you start cooking with heritage chickens, you'll soon need to figure out what to do with all that extra leg meat. (You might have a similar dilemma if you're buying from the store on a budget since legs are often much cheaper per pound than breasts.) This simple recipe is surprisingly delicious and takes just a few minutes of hands-on labor to prepare. If you're starting with a whole chicken, first cut off the legs. 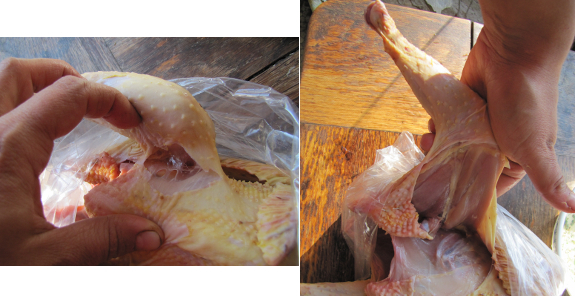 You'll be surprised how easy this is --- just slice through the skin that connects each leg to the breast, bend the leg sideways until the bone snaps out of its socket, and then cut through the bit of meat holding the thigh to the rest of the chicken carcass. 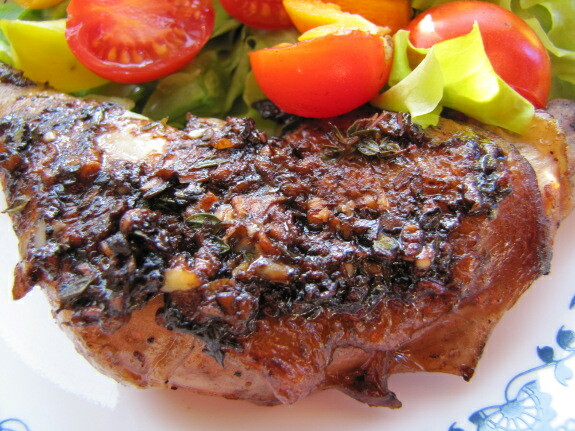 Meanwhile, snip some thyme leaves out of your garden --- about a tablespoonful is the goal if you're cooking two chicken legs. Mix the diced thyme, two tablespoons of lemon juice, and some salt and pepper in a bowl. 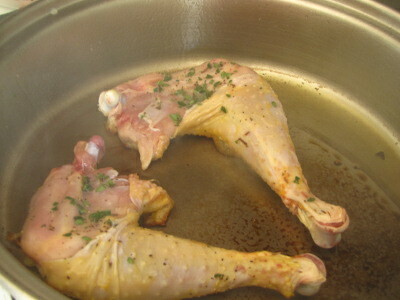 Heat a bit of olive oil over medium-high heat (being careful not to burn it), then put your chicken legs in the pan, skin side down. 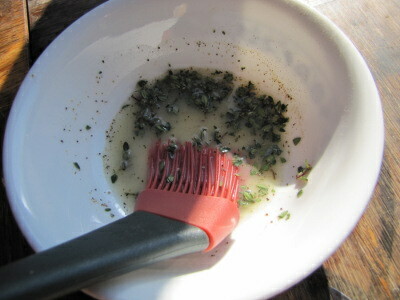 Brush about half of your lemon juice and thyme mixture over top of the legs and cook for around five minutes until the skin is brown. Remove the legs from the pan once they're fully cooked and add 1 clove of minced garlic, the remainder of the thyme, and three tablespoons of water to the pan. 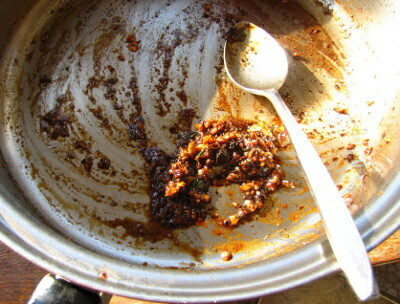 Cook over medium high heat, scraping the drippings out of the pan and into the water. 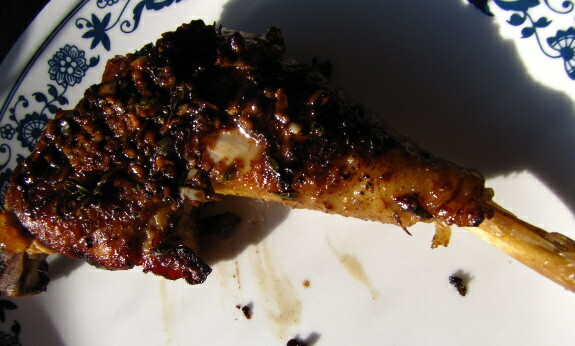 After a minute or two, the garlic should be cooked and the water should be evaporated enough to turn the drippings into a thick sauce to spoon over the legs. Despite having no special spices (or MSG), these legs taste very Chinese to us. Delicious and easy! Learn to build a quick hoop that will extend your fall garden until Christmas in our 99 cent ebook. This recipe for chicken legs sounds great. I will have to try it sometime soon. I was thinking of you as I wrote this post. I think you'll like it! This recipe looks very good indeed. I will be trying it as well. I was watching a video on "brining" yesterday and thought I would mention it to you as it would be great to try on your chicken meat. I have brined in the past and the result has been fantastic. Apparently, it is for lean meats like chicken, turkey, and pork (loin) and the meats becomes super tender. You may already know about this but if not, it may be worth checking out. Sounds really good. I'm going to talk to the wife to see what she thinks. We have been trying to reduce the grocery bill for quite some time. Unfortunately, we usually use breasts for all chicken meals. Buying a whole chicken is another good way to cut back meat costs. I can generally turn a whole chicken into at least six meals --- four meals of the meat alone and then another two to six meals of the stock and bits of meat I pick off the bone turned into a delicious vegetable soup.